In nearly every programming dispute that arises and goes on for longer than a few hours, the distributor makes a public offer to restore the programming and make it available to customers on an a la carte basis with the programmer getting 100% of the proceeds. Time Warner Cable CEO Glenn Britt showed that he loves this old chestnut as much as the others, the full text of his highly disingenuous letter is here. 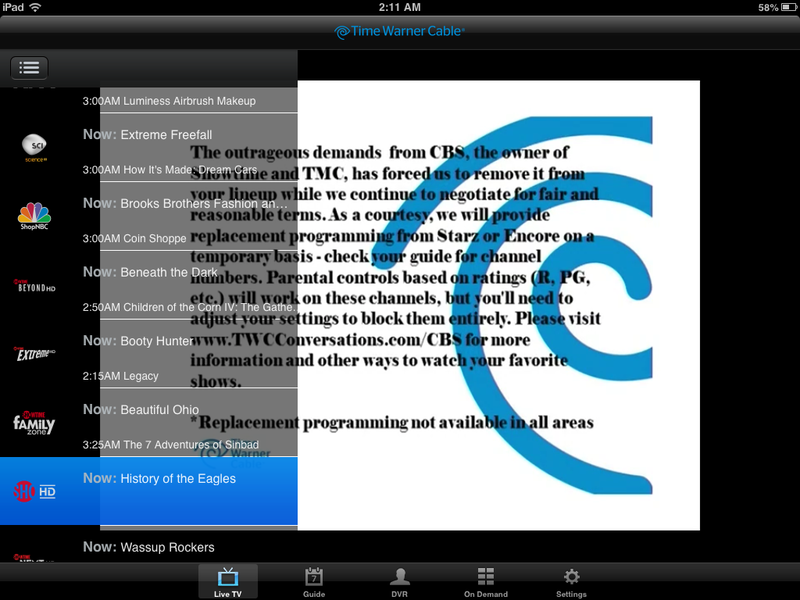 This tactic is a favorite of Cablevision. Here's a rundown of Jim Dolan offering it to the Yankee's YES Network in 2002. It didn't work then. It won't work now. It never works. Leave us out of it. We know that you are fighting over lucre, not our inalienable rights as cable consumers. Pretending that you are fighting on our behalf rather than in the interests of your shareholders and executives is infantilizing and unbecoming. 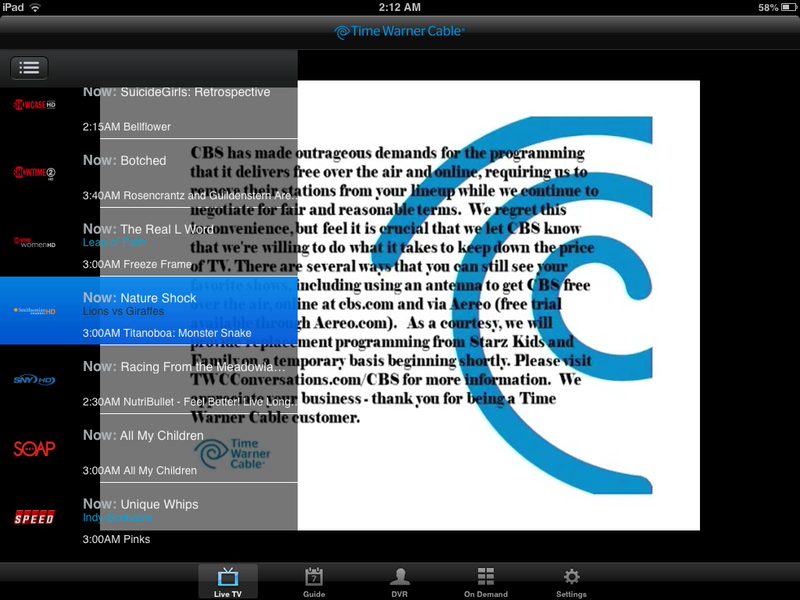 More pictures from the front, these from the TWC iPad app, from a few nights ago. Starting Sunday, 4 August 2013, CBS has filled WCBS's usual channel 2 (702 HD) with Starz Kids & Family. Premium networks, particularly secondary ones like Starz often offer "free previews" to increase sampling for their channels; Time Warner Cable is likely paying little or nothing for this "substitute programming". The choice of the Kids & Family channel from the Starz multiplex likely reflects the fact that it is the only Starz feed without uncut R-rated movies. CBS is received by all cable customers, Starz only by those who make a specific decision to purchase it. As expected, CBS didn't think much of the TWC proposal. Moonves' letter. Variety (Todd Spangler) reports that Time Warner Cable's brand is suffering more than CBS's. Distributors always suffer more in these disputes, since the customer is paying the distributor. 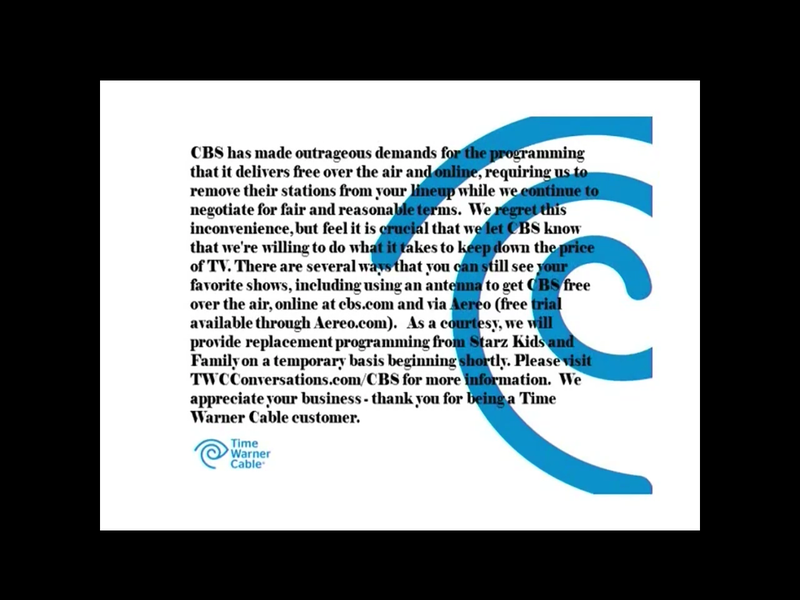 Also, his report that Under the Dome piracy is going up with the CBS-Time Warner Cable blackout. CBS's exclusive, 4-days-post-air deal with Amazon for its summer hit Under the Dome appears to be a big stumbling block for TWC. It appears that in the expired retransmission consent agreement with CBS, Time Warner Cable had VOD rights to prime time shows. Those VOD rights in the expired deal might have been non-exclusive and might not have applied to all prime time programs, but, to the extent that CBS is looking to provide much less this time around, it is no wonder that TWC might object to the change, especially amid a much higher cash fee. One sees reference to this in TWC's CEO Glenn Britt's public letter offer (not the non-starter a la carte offer I mocked above). 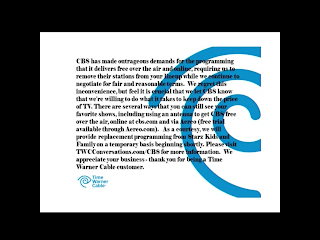 In the interest of getting CBS back on our cable systems today, we write to propose that CBS and Time Warner Cable immediately agree to resume carriage with the new economics TWC reluctantly agreed to during our negotiations, while employing all the other terms and conditions of our recently expired contracts. Although those terms are not ideal to CBS or TWC, and would leave TWC and our customers without the digital rights that CBS has provided to others, since both parties have lived under those terms productively for many years, we believe we should continue to live with them in the interest of restoring CBS immediately for the benefit of consumers. The key phrase is "the digital rights that CBS has provided to others". The other developments in this exceedingly predictable dispute are that over-the-air antenna sales are way up and local news ratings are down in the affected markets. Politicians, like new Massachusetts Senator Ed Market are upset that consumers are in the middle of this dispute, but, of course, that is a necessary consequence of the retransmission consent scheme that he helped write. This has led to discussions about how the retransmission consent structure could be fixed. Rich Greenfield has a suggestion in his blog post today, but unfortunately, it makes little sense. In essence, he wants all the MVPDs in a market to negotiate retransmission consent jointly with a broadcaster, so that if the negotiation fails to reach an agreement, all of the MVPDs will be shut off. Essentially, his solution is that anti-trust laws are suspended to protect the MVPDs from competitive forces in the acquisition of this content. The elimination of retransmission consent (while preserving must carry) seems simpler and more logical, if one were going down this path. Alternately, some sort of compulsory license could provide an additional revenue stream for broadcasters (if Congress feels that appropriate) and predictability to those in, or considering entry into. the MVPD marketplace. I am not advocating such structures, but they would be ways to move public blackouts out of the mix.